By heating water only when it's needed, ENERGY STAR certified gas tankless water heaters cut water heating expenses, while also providing continuous hot water delivery. Gas tankless models are a great choice for new construction and major remodeling, but are also becoming popular as a replacement for gas storage water heaters. Read our Gas Water Heater Factsheet (PDF, 83 KB) to learn more. What else should I look for when buying a whole-home gas tankless water heater? Estimate the capacity you'll need. While the capacity of gas storage water heaters is based on the number of gallons that will fit in the tank, tankless models are rated by how many gallons of hot water they produce per minute (GPM). The more likely you are to have the shower, dishwasher, and clothes washer going at once, the larger the GPM you will need. 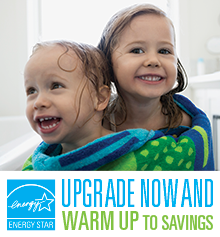 By heating water only when you need it, ENERGY STAR certified tankless water heaters save a family of four $95 per year, or $1,800 over the lifetime of the water heater, on gas bills compared to a standard storage model. Gas tankless models are a great choice for new construction and major remodeling, but are also becoming popular as a replacement for gas storage water heaters. If you want to replace your current gas water heater don't wait until it fails, as this will leave little time to choose and install a certified ENERGY STAR tankless model. Because installation may require the upgrade of your existing natural gas line, as well as special venting for safety and to accommodate higher air flow rates, and running electricity over to the water heater to power the fan and freeze protection element, you will need to allow sufficient time to evaluate costs and complete the change out. To make your life easier, try to have a new one installed before it's an emergency.